I just created YUI3 DateTime Chooser Module. 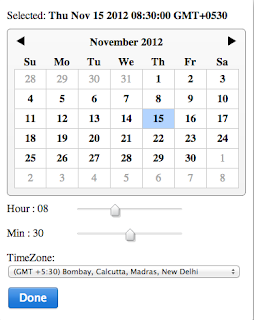 At some time in a webform you have to capture date and time together with timezone. This YUI3 module is to help you in progressively enhance "date-time form input" to popup (calendar and slider based) UI to input date and time with TimeZone.